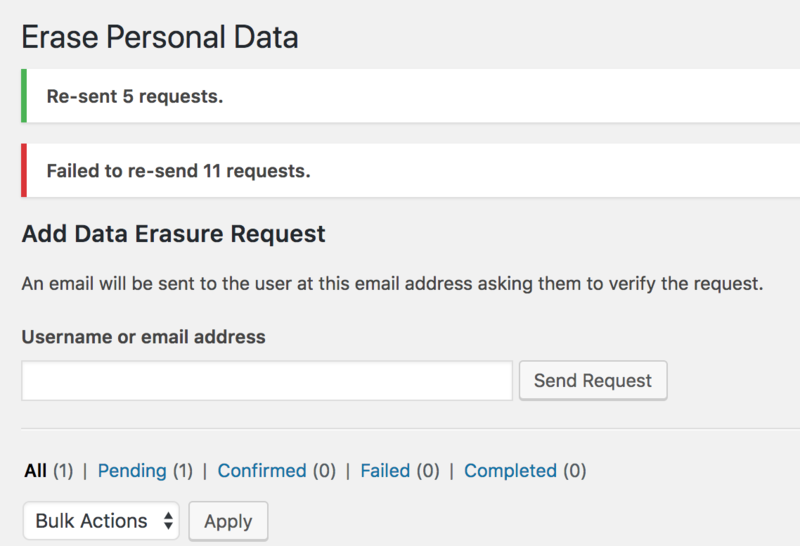 When bulk resending emails for export and erasure requests, failures are not properly reported if there are also successful ones. Example: 3 requests are bulk resent, 2 succeed. The notice when the page reloads is green and says Re-sent 2 request and will not mention the failed request. When there are mixed results, the notice should be a warning (orange) and say Resent X requests, but X failed to resend., or something similar. Also, when no requests are resent successfully, the notice is green and says Resent 0 requests. This should also be a warning. Screenshot from 2018-05-15 19_29_23.png​ (21.8 KB) - added by subrataemfluence 11 months ago. 44081.diff​ (1.8 KB) - added by javorszky 8 months ago. Add ability to have different notifications for successful / failed resends. 44081.2.diff​ (1.8 KB) - added by javorszky 8 months ago. Change wording for the non-action notice. 44081.3.diff​ (2.3 KB) - added by javorszky 7 months ago. 44081.3.2.diff​ (2.3 KB) - added by javorszky 7 months ago. 44081.4.diff​ (2.3 KB) - added by javorszky 7 months ago. 44081.5.diff​ (2.2 KB) - added by javorszky 7 months ago. Reword messages, remove "no requests to act upon" message. 44081.6-44941.diff​ (2.5 KB) - added by javorszky 7 months ago. Same as 44081.5, but also implements a mixed message bar and only displays one bar. 44941 is required to go in before this. I have one question in this regard. Sorry if I am posting it in the wrong thread. I added three email addresses on "Erase Personal Data" screen at my local environment. The environment does not send any real email though. So I used "Force Erase Personal Data" link to change Pending status to Completed. Each of these email addresses on this screen are attached to a user. When I select and try Resend Email in bulk, I always see Re-sent 0 requests. Is this because the local system does not send real emails? @subrataemfluence It may be. What does your local setup look like? I usually use VVV, which comes with MailCatcher. This prevents emails from sending, but catches them in a UI where you can read the emails that went through. This ticket was mentioned in ​Slack in #core-privacy by tz-media. ​View the logs. 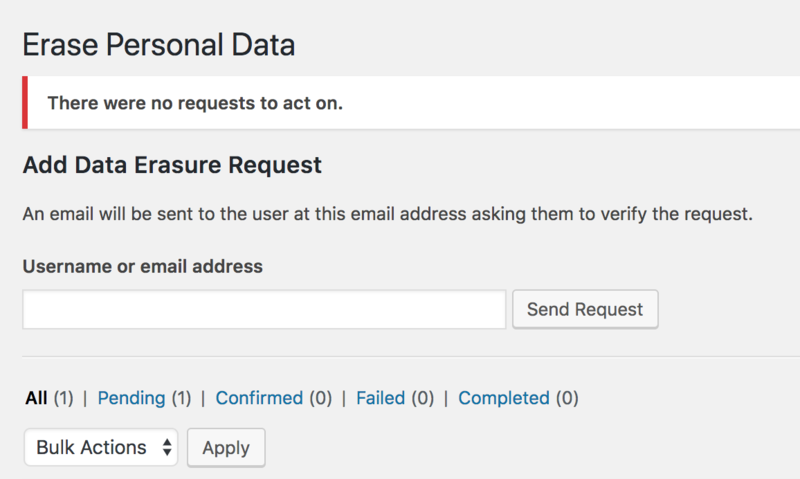 if the bulk action was requested with no requests chosen, it will add an error with the text "There were no requests to resend emails for." if the resends were all successful, it will display the successful "Re-sent X requests" green notice. if the resends all failed, it will display a _new_ "Failed to re-send X requests" red notice. if there's a mix of successful and failed resends, it will display both the successful and failed resend notices. select "Resend requests" or "Delete" from the drop down menu without selecting any of the requests. This should summon the "There were no requests to act on" text. that should summon both notices with the appropriate numbers. as it looks like $resend is either true or WP_Error. ps: It looks like _wp_privacy_resend_request() might need adjustments for it's inline docs, as it says it can return false, but it doesn't look like it. Thanks for the review @birgire ! I'll get these fixed up, along with the inline doc change for _wp_privacy_resend_request() later today. For context, it seems a few of the points @birgire pointed out stem from the changes in , which ensures wp_send_user_request() returns a WP_Error instead of the result of the wp_mail() call. The patch itself looks good and works well for me. There are a few minor alignment issues that can be fixed later. @javorszky was there a reason why you went with two notices (green and red) instead of one warning notice (orange)? I am flagging for some UI feedback, but I think that will prevent admin notice overload. Also, I think that we should account for failures when attempting to delete requests. wp_delete_post() will return WP_Errors when deleting is not successful. @joshuawold can you weigh in with your recommendation how best to implement these notices? was there a reason why you went with two notices (green and red) instead of one warning notice (orange)? * @param string $type    Optional. Message type, controls HTML class. Accepts 'error' or 'updated'. I took the liberty of believing the inline documentation instead of going hunting for the actual declared css classes that are available to me. I'll fix up the spacing issue. Indentation issue has been fixed. Yesterday's office hours briefly touched on this. The end result was that two different notices are better to avoid people only reading the first half of a proposed notice that would contain both info. This ticket was mentioned in ​Slack in #core-privacy by joshuawold. ​View the logs. “Attempted to re-send requests: 5 successful, 11 failed.” With an orange bar. However, given the feedback in previous comments about folks missing the failed notices, I’m inclined to agree that we should keep the success and failed notices separate, at least for now. My only feedback then would be to update the wording slightly. Right now it’s a bit hard to tell if a message was a success based purely on the wording (imagine a situation with a screen reader or someone that was hard of sight, where color is harder to differentiate). Change “There were no requests to act on” to “There were no requests selected to act on.” As a followup I’m wondering if we could just keep people from ever seeing this notice by not not allowing the previous action to happen? Both take into account @JoshuaWold 's feedback on wording. I've also removed the *"There were no requests to act on"* message as it did not achieve anything really. A variant is also up there, in case 44941 goes in. Thanks @javorszky this is some great progress. First I just wanted to flag to discussion here that the bulk resend action was proposed to be removed in #44673. Discussion on that item may determine the fate of this functionality so your input is appreciated. Taking a look at existing core conventions a few notes. The existing response on Bulk Actions when no items are selected is to have no response. This is the same for js and php so if js no action is taken and if php reload occurs. NOTE: This message seems to have been removed in 44081.5.diff so may be a moot point here. But the return; looks to be kept in 44081.6-44941.diff so would need to be updated to return a WP_Error as the phpdoc indicates. with other notices in core. One thing to note about the initial 'Send Request' notice (username_or_email_for_privacy_request) is the use of 'initiated' verbiage instead of 'sent'/'send'. But in the single retry notice (privacy_action_email_retry) it's 'sent again'. For these I'm referring to the above links. *They seem to have separate referers per action. And to wrap up I would go with the separate notices presented in 44081.5.diff for code simplicity, ease of translation and the distinction allows the failed to be denoted as an error to draw attention to itself.